As the song said, it was just like starting over when Bermuda famously inspired what were to be John Lennon’s last works. And now Bermudian artists will have the opportunity to return the compliment with a new tribute CD of the former Beatle’s material. The CD — being produced by Ride the Wave charitable group — is to be released in conjunction with the unveiling of a memorial to the singer/songwriter/peace activist at the Masterworks Museum of Bermuda Art in the Botanical Gardens next summer. 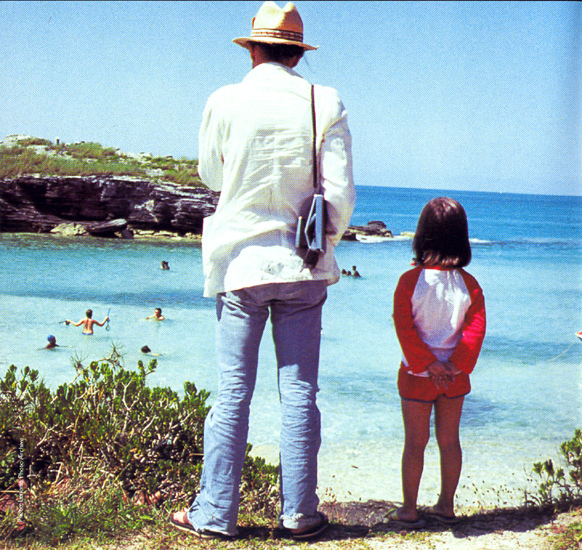 Mr. Lennon spent several weeks in Bermuda in 1980 after sailing here from the US, saying the island allowed him to reconnect with his creative muse after a five-year spell of writer’s block [he is pictured here with son Sean while visiting the island]. Renting a home in Fairylands, Mr. Lennon composed or polished the songs which would appear on the final album released during his lifetime, ”Double Fantasy”. His locally recorded home demos of the Bermuda songs –- some of them also included on the posthumously released “Milk & Honey”  and the “Beatles Anthology”  — have been uploaded on the Internet. “Double Fantasy” took its name from a freesia Mr. Lennon and his young son Sean saw at the Botanical Gardens during their stay in Bermuda. The musician thought the flower’s name was a perfect metaphor for his personal and creative relationship with wife Yoko Ono. 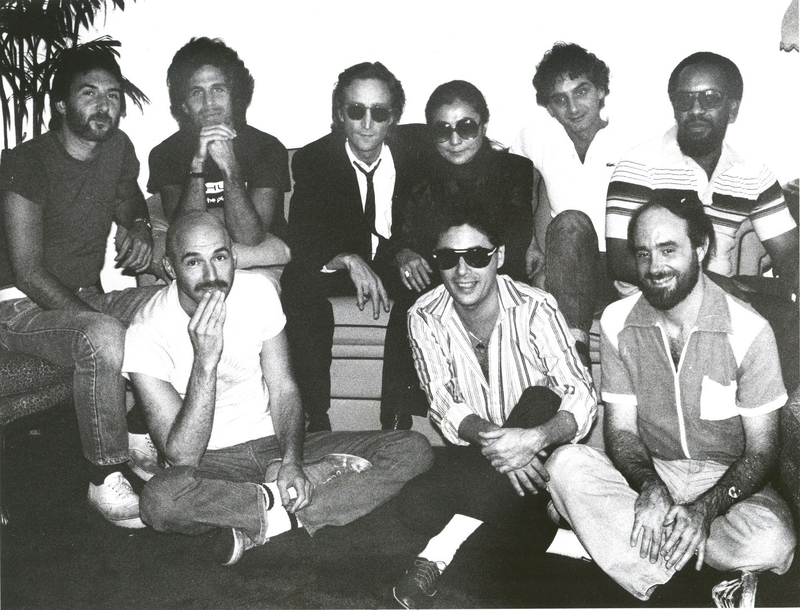 The album was recorded at New York’s Hit Factory studio in August, 1980 after Mr. Lennon had returned to the US from Bermuda. “[John] was in charge from that very first moment,” recalled renowned Bermudian session drummer Andy Newmark, who by happenstance was recruited by Mr. Lennon to play on the album of Bermuda material. “There was not a lapse of ten minutes between when he came in and when things got rolling. Mr. Lennon was shot to death by a deranged fan outside his New York City apartment house in December, 1980 — just weeks after “Double Fantasy” was released. “We want to feature Bermudians recording their arrangements of Lennon songs,” said Ride The Wave organiser Tony Brannon. “Besides the local Bermuda artists, we feel that international artists, who have performed in Bermuda, can be a part of this tribute, and to that end we have asked International artists to participate. During his stay here in the summer of 1980, Mr. Lennon spent one evening at the old 40 Thieves Club on Front Street listening to music and socialising with Bermudians and Bermuda residents. “The John Lennon Bermuda tribute CD and the Masterworks memorial will be big events for Bermuda, and we believe that we can take this way past our little island to make this a global event,” continued Mr. Brannon. “ The benefits for Bermuda will certainly be huge in terms of exposure and the visitors to Bermuda will surely make a visit to the Botanical Gardens and the Masterworks Museum to see the John Lennon memorial a must. “The Lennon tribute in New York City — Strawberry Fields in Central Park — has seen the attendance grow year over year. Strawberry Fields officially opened on October 9, 1985, the 45th anniversary of John Lennon’s birth. Mr. Brannon and Tom Butterfield of Masterworks recently told the John Lennon Bermuda story to more than four million listeners in the UK when eight British Radio stations were in Bermuda broadcasting live from the Fairmont Southampton resort. “There is no doubt the John Lennon Tribute in Bermuda will be an important place to visit for anyone living or taking a holiday here,” said Mr. Brannon. “I have asked Andy Newmark to try and get the other session players from ‘Double Fantasy’ to record a track for the Bermuda tribute CD that could go global both as a song and a video,” said Mr. Brannon. “Personally, I think the message of ‘All You Need Is Love’ — one of the most famous numbers John wrote as a member of the Beatles — would resonate everywhere. “Only John Lennon numbers he actually sang can be chosen — so if it is a Beatles song sung by another Beatle, that does not qualify,” he said. “Try looking for a song from his solo career. “We are also going to be having a competition for Bermuda singers — and those who are selected will be recorded included on one of Lennon’s iconic songs. “Artists will be asked to perform ‘Imagine’. You can either send in your demo tape to Michael Freisenbruch at Freisenbruch Meyer, 75 Front Street, Hamilton or email an existing MP3 of your voice singing any song you have recorded. Keep up the good work Tony. Gonna make you Minsiter of Vibrations. ALL songs submitted for the Double Fantasy Tribute will judged by the producers. We cannot guarantee every song submitted will be included on the CD. The quality and production and arrangements of the songs submitted must be of the highest standards. We ask that all artists submit a “FRESH” approach to how they arrange and perform a John Lennon song. Well I guess your comments above once again prove my feelings about you. Forthright and honest. I can’t contribute to the CD but I will support the efforts and will purchase. Thanks ole horse. You do Your Father and Mother proud. I have been living and recording here in Liverpool for the last 6 years,and John Lennon has been a great source of inspiration for me. This is all to cool,PEACE. Dear God please help us! The golden legacy of the Beatle’s and their timeless sound will be SCARRED by these Bermudians! There is a limit to where people should venture, and I mean okay you can copy Marley and stuff, but NOT the Beatles!!!!!! I can hear it now…. may God help us!!!!!!!!! I really pray that the artists do a STUNNING job because the Beatles cannot be copied. Their style cannot be duplicated. Nobody can sing like them. Harmonies were their forte. I highly doubt any Bermudian can sing or harmonize like them, and it will only bastardize the beautiful godly music the Beatles blessed mankind with! The CD is about a tribute to John Lennon….the focus will be on his solo career BUT some are doing songs that he sang as a BEATLE…..I can guarantee you there will be no scarring and all artists will do a stunning job….it is a requirement that we will hold high for anyone to be part of this tribute. Your comdemnation of Bermudians is insulting. Yes, indeed, let’s be realistic, “Help Us”. As the article makes clear, a world-renowned Bermudian talent was actually hired by John Lennon to play on the “Double Fantasy” sessions. This had nothing to do with Andy’s Bermuda connection (Lennon wasn’t even aware he was Bermudian until the recordings had already commenced). As I understand it, Mr. Newmark was invited to join the “Double Fantasy” studio band because he had earlier made such a formidable impression on George Harrison. So Andy Newmark, a homegrown drummer who made his name and refined his skills playing at various Hamilton nightspots in the ’60s, was actually good enough for half of the Beatles but not for this whining poster … After all, he says Bermudians shouldn’t be let anywhere near the unparalleled arrangements of the Fab Four. Go figure. No, not every Bermudian musician will reach the dizzying heights Andy Newmark did. But Bermuda continues to produce accomplished performers in numbers entirely disproportionate to the island’s population. And they should be encouraged at every available opportunity — particularly given the lack of venues for live music on the island these days. The chance to hone your talents on a once-vibrant nightclub circuit the way Andy Newmark did in the ’60s simply don’t exist now — and who knows how many other potential world-class performers we’ve lost as a result? Personally, I think the tribute CD is a wonderful idea — it will allow some of the island’s most accomplished artists to showcase their talents to a global audience covering some of the greatest popular songs ever written. In any event, as the organisers of the tribute CD have said, they want *FRESH* variations on Lennon’s solo work and Beatles songs — not stale attempts to duplicate the originals. Still, I wouldn’t be so damn dismissive of Bermudians’ ability to reproduce the Beatles harmonies pretty successfully. Anyone else remember the Bermudian choir conducted by actor/musician David Ogden Stiers (Major Winchester in the old MASH TV show) which sang a chills-down-the-spine rendition of “In My Life” for a Tourism Department promotional film back in the ’90s? Great stuff! What a mean-spirited, culturally xenophobic and thoroughly unpleasant post. The tribute CD and the Lennon memorial at Masterworks are heartfelt salutes to a singer/songwriter/genius who went out of his way to publicly acknowledge Bermuda at every available opportunity in the months leading up to his death. Don’t be so smug, “Help Us”. You really should bear in mind something John Lennon used to say: Time wounds all heels … And you certainly fall into the “heel” category from where I sit. Thanks so much for your post. That was so well thought out and written. Wow, “Help Us”. You are clearly unaware of the amazing talent in Bermuda. Do you really think that the organizers would allow for John Lennon’s material to be butchered, recorded and then distributed. Stop and think and then go out there and listen to some of these artists perform!